Are you reading "The Hunger Games" yet? In the ruins of a place once known as North America lies the nation of Panem, a shining Capitol surrounded by twelve outlying districts. Long ago the districts waged war on the Capitol and were defeated. As part of the surrender terms, each district agreed to send one boy and one girl to appear in an annual televised event called, "The Hunger Games," a fight to the death on live TV. 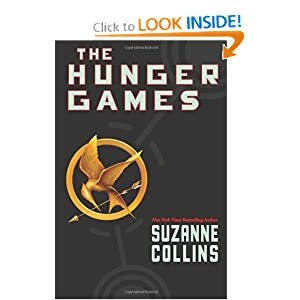 Start reading The Hunger Games on your Kindle in under a minute. Hungry for more Hunger Games merchandise? Look no further than Amazon's Hunger Games Store, where you'll find the latest apparel, jewelry, and games. If that's not enough, buy select physical Hunger Games books and get a $2 credit towards a pre-order of the "The Hunger Games: Songs from District 12 and Beyond" CD Soundtrack. Or sign up to be the first to know when "The Hunger Games" movie is available for pre-order. Looking for your next great dystopian read? If so, check out this list of post-apocalyptic books.